Below are two short, unedited clips from a broader talk given at North Dakota State University (NDSU) on February 24, 2012 by Dr. John O. Voll, one of Georgetown University’s undisputed experts on Islamic history, and the associate director of the Prince Alwaleed bin Talal Center for Muslim-Christian Understanding. 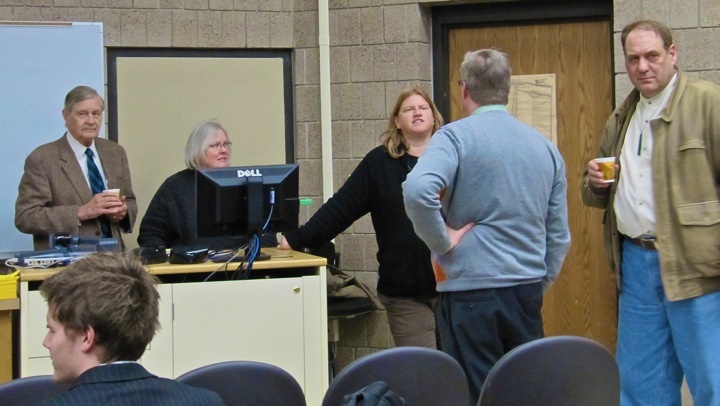 The talk was hosted by NDSU’s Department of History, Philosophy, and Religious studies, (and publicized by the North Dakota Humanities Council) and in large part came together because NDSU’s Asian historian, Dr. Tracy Barrett, is friends with Dr. Voll. Tracy knows Dr. Voll because Tracy’s father, Dr. Roby Barrett, has known Dr. Voll for years (Roby has put in quite a few years with the Foreign Service, stationed in areas of Saudi Arabia and the Levant, or that former Ottoman Imperial stomping ground). In the business of history and anthropology, we often refer to how this all played out — how Voll ended up talking at NDSU — as the byproduct of kinship networks. You can also just call it relationships, too. In MBA Speak they often call it “networking.” (I don’t know why I’m using air-quotes with all these phrases.) The idea and follow through is pretty simple, though, and it plays out often without anyone ever knowing it’s playing out, at least until we look back on how those sorts of things played out. In Dr. Voll’s lecture, he remarked on how the language of occupation has changed from the 19th, 20th and now 21st-centuries. In the 19th it was “To the Barricades!” and today, at least in 2011, it has taken on the term of occupation. That the Arab Spring used the phrase pragmatic program (literally, the revolutionaries want things — government and institutions — to simply work) and that this came up in Voll’s talk, and because I’m a geek, I asked Voll whether Wael Ghonim or other educated elite revolutionaries were grounding the intellectual trajectory of their pragmatic program in, for example, chapter 2 of William James 1907 work, Pragmatism. Voll responded with, “No.” But then it fed into broader ideas about how we might conceive of as the West today, in the 21st century: it can be thought of more as an abstract idea than something that can be contained within a geopolitical boundary. From left to right, John O. Voll, Angela Smith, Tracy Barrett, Dennis Cooley, and Tom Isern. How words or definitions are appropriated and used throughout the world is another point of consideration, especially since a 21st century occupation in north Africa is going to have a couple similarities, but also many more differences when compared to a 21st century occupation in, for example, Portland, Oregon, or Wall Street. Yeah, occupations in North Africa are putting much more on the line, and Voll said the chaos from the revolutionaries might not at this early stage appear to have an ideological trajectory (then again, saying one does not have a philosophy is in fact a philosophy of not having a philosophy). But the most important thing to remember is how the seeming chaos brought on by revolutionaries are ways out of the existing (or former) strong-arm regimes (in the 1970s, John Lydon spear-headed a similar movement in Great Britain). Once the revolutionaries in North Africa get out from under these boots, they will continue articulating and charting their own courses for today and tomorrow. This, no doubt, begins at the grass roots level, or with what we call individual relationships, regardless (or, if I want to be annoying, irregardless) of whether we’re at North Dakota State University, Georgetown, or North Africa. Web 2.0 is helping it along indeed. This entry was posted on Sunday, February 26th, 2012 at 12:13 pm	and posted in Uncategorized. You can follow any responses to this entry through the RSS 2.0 feed.